There’s another action-packed sequel in the Death Rate franchise, “Death Race: Beyond Anarchy,” on Blu-ray™ combo pack, DVD, Digital and On Demand October 2. Thisfunktional readers will get the opportunity to win their copy. To enter you must be subscribed to my YouTube channel: Thisfunktional and follow instagram.com/Thisfunktional and email me your full name and mailing address with the subject line #ThisfunktionalContest #DeathRaceBeyondAnarchy to Thisfunktional@Gmail.com. The stakes are higher than ever in the intense action-adventure “Death Race: Beyond Anarchy,” arriving Unrated and Unhinged on Blu-ray™ combo pack, DVD, Digital and On Demand October 2, from Universal Pictures Home Entertainment, in association with Impact Pictures/Chestnut Productions. The wildly anticipated next installment of the popular Death Race franchise, this Universal 1440 Entertainment original production brings fans along for the deadliest competition on wheels, where brutal fights and explosive car races abound. An action-packed thrill ride, this all-new movie is the grittiest and bloodiest installment yet.Franchise newcomers Zach McGowan (“Black Sails”) and Danny Glover (Lethal Weapon) join returning Death Race fan favorites Danny Trejo (Machete) and Fred Koehler (“American Horror Story”). Death Race: Beyond Anarchy also features talented actors Christine Marzano (Rules Don’t Apply), Terence Maynard (Edge of Tomorrow) and Velislav Pavlov (The Expendables 2). “Death Race: Beyond Anarchy” on Blu-rayTM, DVD and Digital, includes exclusive bonus features that take viewers deeper into the intense world of Death Race, with special behind-the-scenes footage and filmmaker commentary. 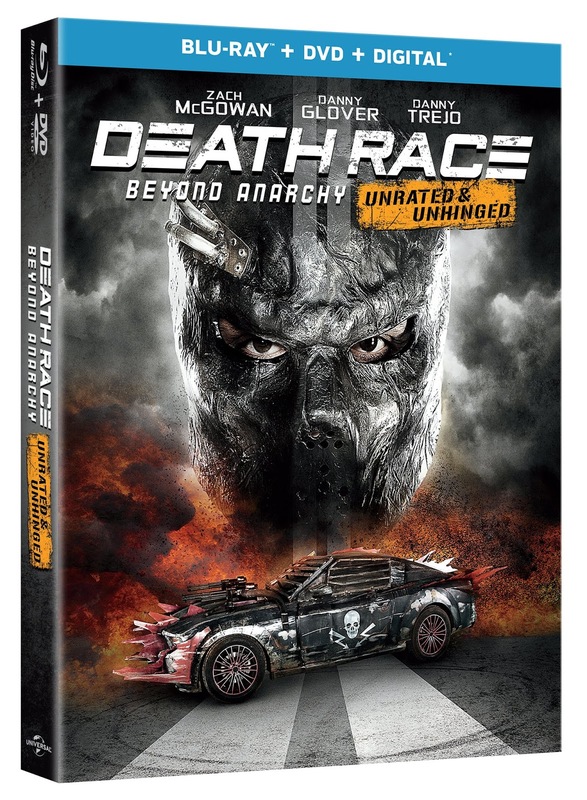 Additionally, “Death Race: Complete 4-Movie Collection” will also available on DVD on October 2.